Social video expert Unruly reviews the latest viral by Android. For a brand whose name suggests emotionless robots, Android is rather concerned with seeming cute and cuddly. Whether it’s their chubby, lime-green mascot or the fact they name their operating systems after sweets, the Google-owned brand appears to run on sunshine and rainbows. 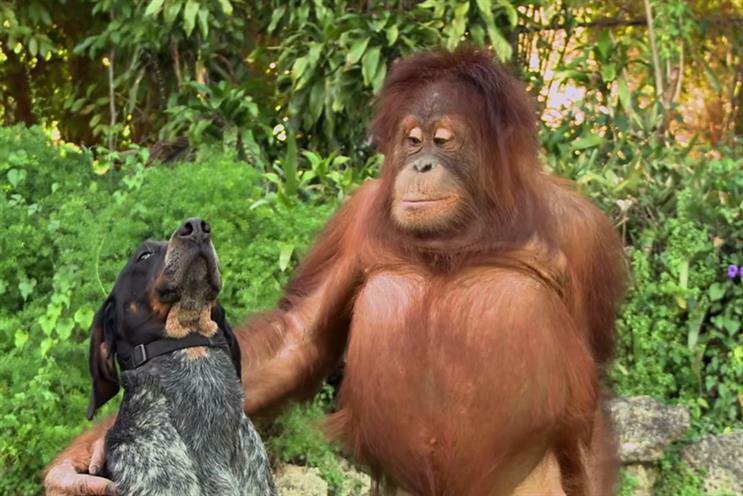 Android’s latest spot, ‘Friends Furever’, will do little to dispel this. Far from a gritty reboot, the spot cuts together YouTube clips of adorable animals playing together, while a folksy song plays underneath. If that sounds simple even for a brand that famously doesn’t like to overcomplicate, there is one little twist. Each clip in the montage features unconventional pairs of animals: dogs and elephants, chimps and horses, even tigers and bears. It looks a bit like Noah’s Ark had a ‘shuffle’ setting. Besides the obvious 'aww' value, ‘Friends Furever’ is the ideal complement to the ‘Be Together. Not The Same’ campaign the brand launched last year. Cheerleading for both unity and individuality, Android’s spots have sung this song before, giddily cramming human creativity into breathless montages, Yet this latest spot is a huge step forward for the brand. In fact, ‘Friends Furever’ may be Android’s best ad to date: sharper, sweeter and more on-brand than anything they’ve produced before. With 715,000 shares since release and currently riding high on Unruly’s Viral Video Chart, it’s certainly its most shareable. From the homespun feel of the YouTube clips to the whimsical music, the direction provided by agency Droga5 is a masterclass in understatement. OK, and featuring a series of fluffy animals doesn’t hurt, but what really makes it stand out is the execution. While animal videos (and particularly, cat videos) tend to share well since they evoke feelings of warmth and comfort, we know it takes more than a slapdash iMovie montage to reach nearly a million shares. "You don’t have to be a cute animal to show the world how to ‘Be together. Not the same.’ But it definitely helps." Where Android succeeds is in producing a spot that exists simultaneously as a charming, shareable piece of content and an extension of its brand messaging. This is a surprisingly hard trick to pull off. Whereas the brand has previously attempted more technically complex or spots, these ads failed to gain traction on the social web. Similarly, older ads like Be Together. Not The Same bring the same DIY energy but over-complicate the experience with narration and overt messaging. The brilliance of ‘Friends Furever’ is that it’s unobtrusive. Everyone knows the simplest solution is often the best. Android’s effort shows us that by adding clever brand messaging (and maybe a duckling or two), you may have a hit on your hands.